- Windows laptop (Tested with Windows 7 32-bit and 64-bit, Windows 8/8.1 64bit). Other versions may work, virtual machines may work, but are not well tested. - Unzip the d2xx drivers to a temporary directory. With the Rosstech cable there is no need for extra drivers, but you must set it to dumb mode (Open VCDS --> Options --> uncheck ‘Boot in intelligent mode’ or check ‘Boot in dumb mode’ – depending on your version of VCDS). - Plug in your KKL lead (it is recommended to use the same usb port each time you plug it in - windows can attach different drivers to different usb ports, and the com port number may change if you plug into a different port). - Open device manager (Start -> Control Panel -> System-> Device Manage) and view 'Ports (COM & LTP). In this case Windows has identified it as a USB com port and installed a driver, but this needs updating to make sure it is the latest driver, so click 'Update Driver', 'Browse my computer for driver software', and select the directory you unzipped the d2xx drivers too. Once drivers are up to date, set your com port to com1 - this is not necessary for NefMoto but it makes it easier for other tools (Port Settings -> Advanced..). Once the cable is detected, select the baud rate as 38400 Baud, make sure 'Slow init' is selected, then click 'Connect Slow Innit'. - Try lowering the Baud rate. - If you are trying to connect in the car, try unplugging the fuses for your instruments. There are usually two fuses for instruments, a permenant feed and an ignition switched feed, if you have full-dis there may be a fuse for the screen too. - If you are using a bench lead, try connecting in the car. Once successfully connected, attempt to read the flash file from the ECU, by clicking the 'KWP2000 Flashing' tab. If you are unsure what size your ECU is, a quick google will probably answer the question (search for the part number that nef lists when you connect, e.g. “KWP1281 connect info: 6A906032HN”, and ecu size), if not the flash size is listed on the top of the chip inside of the ECU. You can read a 400BB flash using the 800BB memory layout. It will read an extra 512kb past the end of the file, if you chop it in half you are good to go. The 'Full Read Flash' button should now be available, so click this and it should start to read your ECU - sit back and wait a few minutes. If all is successful, Nef will prompt you where you want to save the flash file you have read. - Drop the baud rate to 38400 after you have connected to the ECU. After reading flash off their ECU, most people want to remap their car – to increase power, remove emissions control systems, add extra functionality etc. Nefmoto and the forums will not do this for you – you will need to put in the effort to remap your car, if you are prepared to learn then people will help you. If you want it to be done for you, go pay a professional tuner. You will need a map editor, such as winols (expensive) or tunerpro (free). If you cannot find a definition file for your ECU, consider using a different bin file which does have good definitions – many ecu’s can be cross flashed. This should not be attempted at random and you should stick to proven combinations until you are familiar with mapping, 512kb and 1024kb ECUs are not interchangeable. A good example of this is the ‘S4 M-box’ which can be used on many other 2.7T ECUs – more information is here http://s4wiki.com/wiki/Generations. If you are attempting this, look through threads talking about cross flashing, or ask for suggestions. If your file has checksum errors, DO NOT write it to the ECU. - Open up NefMoto, connect to the ECU as described above and select the ‘KWP2000 Flashing’ tab. 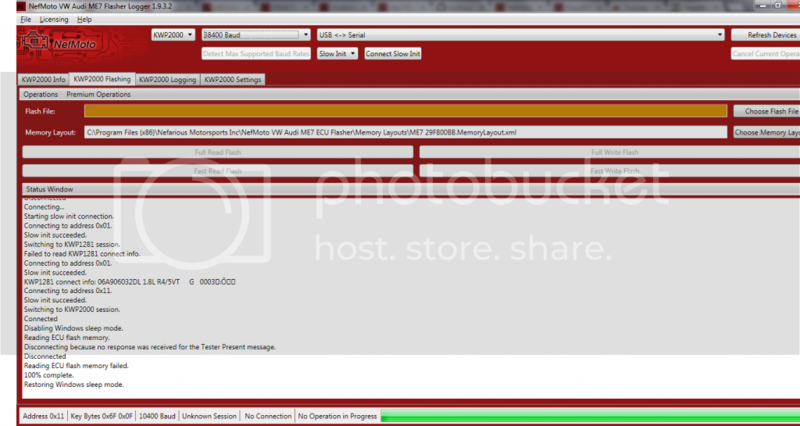 - Click ‘Choose Flash File’ and select the file you wish to flash to your ECU. - Verify you have selected the correct memory layout for your ECU. Once it has finished flashing, turn off the ignition if the ECU is in the car, if it is on the bench, disconnect the power. Q: What cars does Nefmoto flasher support ? Q: Will my cable work with Nefmoto? A: A: Most KKL cables and genuine RossTech cables will work with NefMoto. Read the “Setup Nefmoto” section of this guide for more info and links. Q: Can I use nefmoto to immo delete an immobilized ECU? Q: Will nefmoto tune my car? Q: Will you tell me exact steps to tune my ECU? Q: Will you tune my ECU for me? Q: Can I harm my ECU in any way? Q: If I damage my ECU can nefmoto recover it ? Q: What is an ‘M-box’? A: A: An Audi S4 8D0907551M ecu. Generally considered to be a good basis for S4 tuning as it has good definitions. Q: I have a xxxxxxxxxxK K-box, can I flash on a M-box? A: A: The ‘?-box’ shorthand only refers to S4 ECUs, and the ?-box is irrelevant if you are not talking about an S4 ECU. Cross flashing is only possible between compatible ECUs, and even ECUs that are the same part number with a different letter may be incompatible. To Add to the Settings for the VCDS cable. Make sure you remove the boot intelligent mode in both your Main VCDS and Beta version if you are running any. I followed the guide last night. Personally, I got stuck as soon as I needed to select the if the ECU file is 512k or 1024k. I googled as per suggestions given, with no answer provided I'm afraid. So that is where I stopped. How do we go about finding out if our ECU's are in fact 512kb or 1024kb? Is there a tell sign or info provided via VCDS that can confirm this for us? My Box code is D, I did however find the answer on a M-box code. Interestingly, I some how had that link open on my laptop at hom already. So unless 512K is at the end of the ECU info. All other are always 1024k meaning we use the 29F800BB file checker? The other listed ecu's are, most recent ecu's are, some older ones are 512kb. so i tried to do a read on my wifes gti just now and i get this error any ideas why or to get around it? I tired different baud rates but just for fun i went to try it again and got this error. Disconnected because no response was received for the tester present message. What can this be? On 1.8t that usually means that pin121 is not powered up. You are doing this on the bench?